Keep the mental health momentum going! Help us continue to surpass our fundraising goal - continue to donate to Outrun the Stigma Calgary 2018 until October 31, 2018! Apply for our new Diversity of Our Mental Health Stories Story Sharing Contest! Application deadline is November 21, 2018. Donate to Outrun the Stigma Calgary! 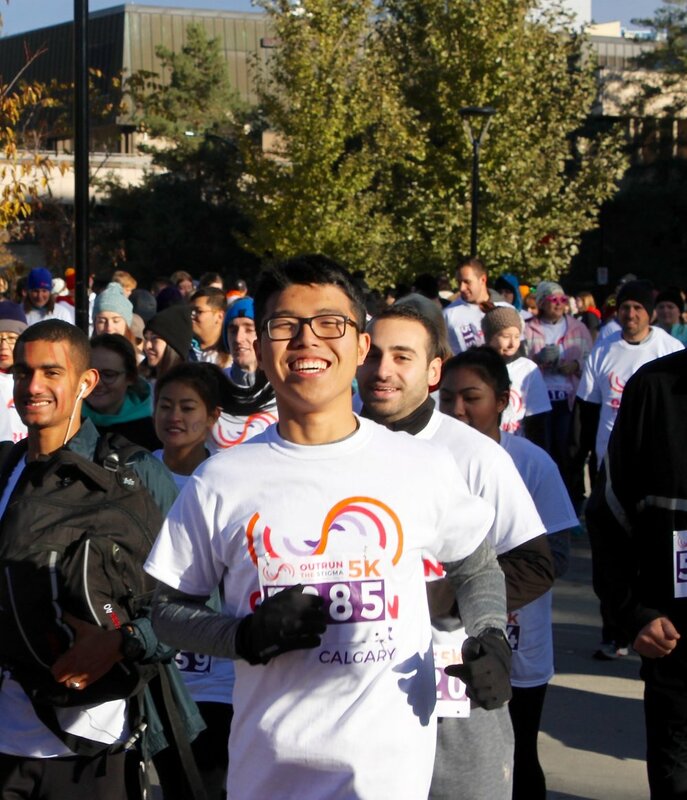 Outrun the Stigma began in October 2013 at the University of Calgary as an annual mental health run / walk. Three years later, we are still working hard to end the stigma through our events and online platforms. Partnership is at the heart of everything we do. We will work to ensure your support benefits your business goals, engage staff in meaningful ways as well as create shared value. Our goal is to reduce mental health stigma by hosting annual Outrun the Stigma event runs and hosting an online story sharing platform. We began in Calgary, and so far have expanded to Edmonton and Toronto with more cities throughout Canada coming in the next years. To support the efforts of Distress Centre Calgary and CMHA Edmonton. Beginning as a student group at the University of Calgary and then transitioning to a not-for-profit in May 2016. To join in our annual walk/run's in Calgary and Edmonton. We want to fight mental health stigma in communities across canada. Click here to find out how to bring Outrun the Stigma to your community! My self-worth and identity are not tied to mental illness, but rather to family, friends, and relationships that shape me. It takes a team to organize everything that Outrun the Stigma does. Let's Outrun the Stigma together. You're not alone. When you share your story you can give hope to people who are going through similar situations to you. We run various projects throughout the year as well as our annual runs. If you have an interest in helping us, read on. Donations are used to support our mental health story sharing initiatives, annual run/walk events, and other activities.